An old time favorite the Purple Smoke Bush gets it’s name form the smoky plumage style flowers that this shrub / tree sends out in late Spring. This shrub can grow quite large and I have in the past pruned overgrown shrubs into small specimen trees that reach upward of 10ft. tall. 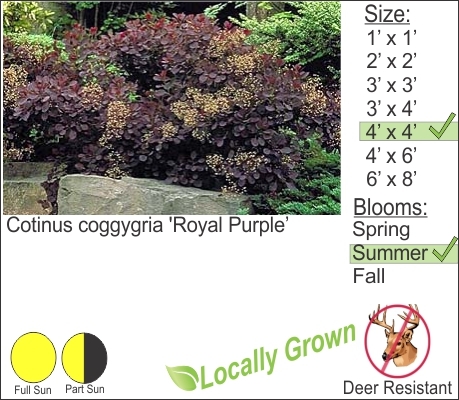 With whorling purple leaves throughout the growing season this shrub does deserve a spot in your landscape. Make sure to give it plenty of space. You can also keep smoke bush trimmed to your desired height.